I'm concerned about how those who stand up for truth get bashed and torn to shreds by others who are threatened by it. At the least, others stiff-arm them for their stand but it can get pretty ugly sometimes too. I'm more concerned this is going on within the Body of Christ as well. If I've learned one thing about truth it's that it often offends people. It has always been this way, even in Jesus day. What is most concerning is how others react to or treat those who are speaking up in truth. I mean it's one thing to reject it, but it's quite another to mount a malicious attack against a person or group of people because someone felt offended or didn't like the truth being spoken. Sometimes the truth is difficult to hear; sometimes it's bittersweet. Nevertheless, it doesn't change the truth itself. When it comes to the truths of God and His Word, we can't pick and choose what we find applicable and what we do not. God's truth is just that - His truth. We must align with it and not the other way around. I pray the Lord helps us all to walk carefully and humbly in this. Ecclesiastes tells us there is a time for all things, including a time to speak and a time to be silent. I think we've entered into a time of standing up for and speaking the truth, but the key is to do it in love. Here's the thing about truth - it is what it is. Truth has no agenda but to reveal the actual state of a matter; reality. You can deny it, stuff it in a closet, lock it up, and throw away the key; you can pronounce it dead and bury it; you can even give it a tombstone - "Here lies the Truth." 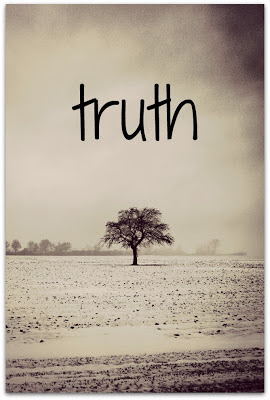 But eventually, the truth will come out; it cannot be buried, hidden, or suppressed forever. Mark 4:22 confirms this: "For whatever is hidden is meant to be disclosed and whatever is concealed is meant to be brought out into the open." As believers, we of all people should desire to walk in truth. And not half-truths or self-serving truths, meaning not just the parts of truth that only make us feel better, look good, or serve our purpose, but the fullness of truth. Holy Spirit is the Spirit of truth who leads us into the knowledge of all truth (John 16:13). He wants to show us truth and we need it. We need Him too; perhaps more than we know. I now believe the question has become - do we even want to hear and know the truth anymore? Because once we come into the knowledge of truth, we then become responsible for it and that scares a lot of people. Some people just plain don't like it but we cannot live rightly without truth governing our lives. Satan, our enemy, opposes and despises the truth and those who stand for it, and he will work through people who have that in common with him. However, we must not forget that Paul said our battle is not with flesh and blood but principalities, powers, rulers of the darkness of this age and spiritual wickedness in high or heavenly places (Ephesians 6). Honestly, we must first desire truth in our own lives, as Jesus is the truth (John 14:6). Then the more time we spend with "the truth" - that is Jesus - the more truth we will desire to live and walk in. He is faithful to help us to do that but we must have our hearts rightly aligned with Him. I think we need to learn to stand in the strength of the Lord and the power of His might, seek His wisdom and counsel, and put on, and keep on, the whole Armor of God, which includes the belt of truth (Ephesians 6:14). We also need to learn how to effectively overcome the enemy through prayer, intercession, and declaring God's Word (our sword). In the days to come, I seriously believe we're going to start seeing those who will adamantly take a stand for truth and those who will adamantly oppose it. I think we'll see those who will truly surprise us all by standing up for the truth and speaking the truth; even those we'd least likely expect to do so. Conversely, we'll be just as surprised by those who won't. I think we've already begun to see this unfold but we'll see it even more so in the days to come within parts of government, business, education, medicine, and yes, even in the Church. We need to know and have an understanding of His truths. We must read and meditate on the Scriptures and let it soak in our hearts, minds, and spirits. In other words, we've got to study the Word. And not casually but with intention and by the leading of the Spirit. This, balanced with godly discernment, will be what keeps many from deception, which is what Jesus warned of in Matthew 24, Mark 13, and Luke 21. Only God Himself can reveal some truths but as His people, we should desire to know and walk in His perspective of truth. He operates in it, delights in it, and abides in it; so should we. Amen! I had shared one of those pictures with sayings on them last week on facebook. It says "Truth is still truth, even if no one believes it. A lie is still a lie, even if everyone believes it." What a great post Michelle. Thanks so much, Ginny. I really feel strongly that we are in a time of revealing truth. With everything; even Lyme.